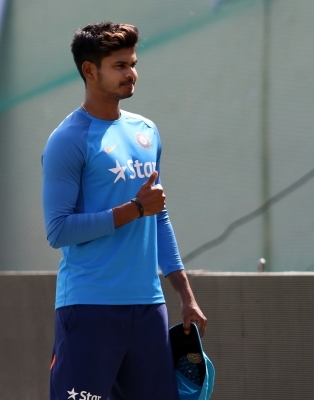 New Delhi, Oct 31 (IANS) Promising batsman Shreyas Iyer on Tuesday said he is open to bat at any position in case he makes his India debut in the first of the three-match T20 International series against New Zealand at the Feroz Shah Kotla here on Wednesday. The Mumbai youngster has been on the fringe of Indian cricket team for long now. He has been named in the Test, ODI and T20Is squads on various tours but could never find a place in the playing XI. “Obviously I am hoping that if I am selected (in the squad) then I will play as well. We have three matches and if I play even one then it is a good feeling,” Iyer told reporters at the pre-match press conference here. “I am very flexible and I don’t mind batting at any number. Even in the IPL I was shuffled from number four to number three and it didn’t really matter because I am comfortable playing in any position. If I play the game, I’ll bat at any number and will give my best. Iyer further said he was yet to attend any of the team meetings yet and even if he isn’t included in the playing XI he will continue to put his effort. “I have not attended the team meeting yet. I am not thinking about playing. Even if I am sitting out, I will put effort. In the end, the team should win,” he said. Iyer recently led the India ‘A’ side to a series win in South Africa. He scored a century in the final game against South Africa ‘A’, which he felt boosted his confidence. “It was really helpful for me as it was the final game. The South Africa A team was very challenging. We had lost the first game against them and the second game went till the last over. “The final was the decider and I was having a good run. I was getting starts but was not able to convert them. In the final it came out really well and it was a satisfying to get the team through. “Obviously when you do that you get a lot of attention from your teammates as well. You have to contribute in bits and pieces as well,” he added.